Pub Crawl, February 2010 (Pubs 21-25) | Come Here To Me! « My Goodness! The Blackrock Market delivers. Now; it was in my head beforehand that this months pub crawl was going to be a rare treat; We were all to be taking our pints in five pubs we hadn’t set foot in before, a rare occurrence when you consider we once tried naming every pub we’ve drank in Dublin before, and ended up giving ourselves migraines. And I wasn’t to be disappointed. This Sunday, our territory had been marked out in advance by fellow pub-crawler JFlood; we were out of the town centre, away from our comfort zone and up into his neck of the woods- this week, CHTM would hit Rathmines. Now it’s odd, I’ve been in Dublin for nine years now, and have been drinking for the majority of those, but I’ve never crossed either of the canals for a pint; unless you count the student bar in UCD that is, or of course Croke Park, the odd time my home county made it there. So there’s a wealth of pubs that I’ve yet to experience, many roads to walk and chippers to drunkenly stumble into afterwards… So, still feeling the after-effects of a bit of a mad one on Saturday night, but looking forward to more-of-the-same, I met with the usual heads at Portobello plaza, and we were joined by another connoisseur in Soundtracksforthem veteran DMcHugh. Crossing the bridge into flatland, we were given a heads up on a bit of local history from jaycarax, who told a tale of the first bridge to cross the canal at Portobello, and a horse drawn carriage that plunged into the lock from it, taking the lives of its six inhabitants. This led to a tradition which was followed for many years of superstitious people disembarking from their transport at the Rathmines side of the bridge and walking across, only to take it up again on the far side. So, enlightened by that gem, we made our way to our first port-of-call, Toast, on Lower Rathmines Road. 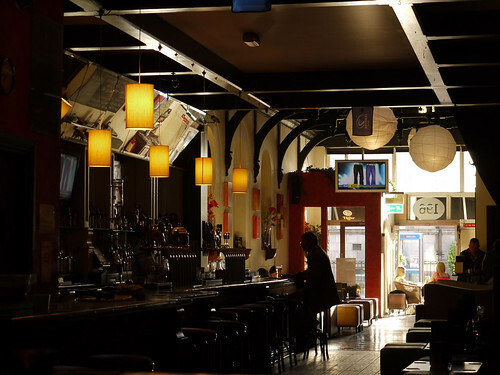 According to John, this is the bar that the yuppies and monied classes of Rathmines drink in; A self-styled Café Bar, it’s the sort of place you’d have your “hummus pannini and skinny latté” types alongside seasoned Guinness drinkers. Deceiving from the outside, the bar stretches well back more than its exterior would suggest, and seating is a mix of high stools around tables and comfy looking sofas around low tables. Unfortunately the latter were all occupied so we had to make do with the former. Nice looking on the inside too, this place, recently redecorated by the looks of it. At €4.35, it wasn’t a bad pint, but not a great one either; Something I noticed on this pub crawl was that, while we didn’t get any terrible pubs for pints, we got two lovely ones, two mediocre ones, and one that just didn’t go down right. And this was one of the mediocre ones to be honest. But still, we were happy enough here, we had plenty of space, and the bar-staff even brought us down our pints. This is one of those pubs in which Diageo is running its “Pour your own pint” initiative; We stayed well clear, though there’s a couple of barmen/ex-barmen in the group, we said we’d leave it to the staff… It is their job after all! I liked this place to be honest; It’s the kind of place you might stop by for a pint and the spuds on a Sunday and a read of the paper. Having settled in comfortably and taken in as much of the atmosphere as we could in a short time, we upped and headed out. As I said, JFlood picked out the route this week and he didn’t disappoint; Next stop was to be MB Slattery’s, JFlood giving us a nice spiel on the history of Rathmines Town Hall on the way. As soon as we walked into this pub, I knew straight away we were onto a winner. 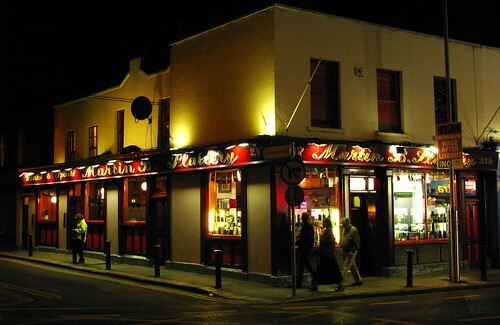 For those of you who have never been before, Slattery’s is one in a line of pubs we are losing in Dublin bit by bit- Think of Mulligan’s crossed with Grogan’s, minus the journos and failed writers and you’ve got something close. Unfortunately the little snug inside the door was occupied so we had to make do with a few stools down the back. No matter, lots of ledges and tables to rest the pints on and plenty of space to make ourselves comfortable in. At €4.30, this was one of the lovely pints- You could tell the difference between a good pint and a mediocre one- that after a round of “Sláintes” and a mouthful taken apiece, a certain satisfaction creeps into us all; just lovely. It’s this kind of boozer we’re running out of in this city, as they get shunted out and replaced by pretentious café bars, and the culture and social history that go along with them find it harder and harder to keep on. Obviously the gaffer is sport mad, the walls are bedecked with Irish flags, while a Munster flag and a couple of sporting wall-planners hang on the wall down the back, it pleased me to see that as soon as the football was over, the telly was turned off. No having to spend your quality pub time spoiled by the annoying drawls of Dunphy, Giles and co. I come to pubs for pints and conversation, not to hear those twats! Nice spot from DFallon, copping that while there was no mirrors in the jacks, there was a St. Pauli sticker on the condom machine- We all had a smile at that one. It was with a heavy heart we left this place, for a number of reasons, and we made our way around the corner to Graces/ The Loft. Now, while airs and graces weren’t required in Slattery’s, they certainly weren’t required here. This is definitely a locals bar, as the shouts and laughter indicated as we entered- no, they weren’t in our direction, just between regulars whose main topic of conversation was to rip the piss out of each other. I don’t blame the barman for eyeing us somewhat suspiciously but he, along with the regulars soon lightened up and we had a chat about the rugby while waiting for the pints to settle. The cheapest pint of the night here, at €4.10, but I’m sad to say it was one of the mediocre ones; maybe it’s just that the drink in Slattery’s was so good, but the pints here just didn’t go down as well. That said, it’s a nice little boozer, maybe not one you’d take a lady friend to on a first date, I’d pick Toast for that accolade, but alright as a “waiting for me mate so I might as well get a quick one into me” sort of place, it reminded me of the Metro on Parnell Street to be honest, plain and not a whole lot going on, but not the worst place around either. Plenty of space in the place divided into restaurant style booths, but with comfy seats; Not one I’d rush to go back to but I wouldn’t mind ending up there either. Looking for pictures for this piece I see they do music, I’d like to try it on a night like that and I might be more enamoured! Next up on the list was Mother Reilly’s and lord, was I happy we found this place. As inviting as Slattery’s was, Mother Reilly’s is my kind of place and one I’ll definitely be back to. The place oozes character, with flagstone floors, oak beams, candles and cubby holes; It has the feel of a lovely pub, with two (gas powered) open fires that the friendly bar-staff had no problems with us pulling our stools up around. An absolutely cracking pint to beat all that too, great value at €4.15 (or €3.50 with a student card.) 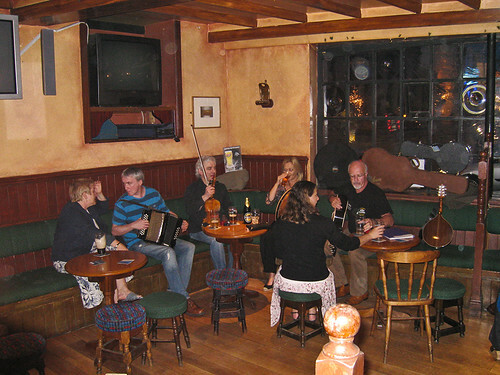 I think we all agreed this was the top pub of the night, for look, character and musically too (piped music at a low volume, but good piped music, and that makes all the difference!) DFallon had a Christie Moore songbook with him for some reason, and it was very tempting to bang out a few of the tunes within; You get the feeling they couldn’t care less in this place if you did- I’m sure the regular that happened on our conversation about Moving Hearts might have even joined in. A large beer garden/ smoking area out the back looked as though it might have served us well, had it been closer to the month of June or July, but the February cold drove us closer to the fire, and all the better for it. We took in a couple more pints, such was the welcome in this place, and a props to jaycarax and H for sticking with the black stuff; Usually by the forth pub they’ve switched to the lager- shocking stuff I know, but I think we’ve finally got them hooked. About time and all. I think this joins a list of maybe three or four pubs out of the 25 we’ve visited so far that I’d have no problem recommending to anyone. I’ll be back for a Random Drop Inn anyways. With the night getting on, we decided a pit-stop for soakage was in order so we took a detour up to Burdocks. Fast becoming a staple with us here, their 2-for-1 deal on Haddock and chips (€4.60 a piece between two, sure you’d spend that on a pint.) It went down a treat anyways, and we didn’t stay long as we were due to hit one more pub before the long trek home. I was skeptical enough about the last pub on our list, as the locals in Graces laughed while telling us most of our number wouldn’t get in what with their Dublin accents… We soon realized what the joke was about when we headed into Rody Bolands and saw that every wall was bedecked in Tipperary garb, pictures, old hurls and the kind of tat you’d see in any Irish pub anywhere in the world. We just couldn’t take to this place at all- Why have a beautiful, old bar like this banging out the worst kind of 80’s pop at such a high volume? Where Mother Reillys was a joy to behold, this place was the opposite, the pint of plain tasted a bit sour here, and the music was a complete turn-off. We were unfortunate in that trad sessions run here on a Sunday nights from six, but JFlood wasn’t informed when he was talking to the barman earlier in the week that they ended at eight. Again, what’s the point in that- Surely people are only getting warmed up at that stage? Maybe if we were all a few years younger, and on the pull for someone from Cork, Clare or Tipperary we’d have enojoyed it but… It just wasn’t for us; another night, maybe it would have been fine but. The pint, as I said, wasn’t the may west, and as far as I recall, came to €4.30. Service was prompt, and there were plenty of floor staff around, collecting glasses and cleaning tables. That, I liked, as well as the old shop counter up at the back, which I thought was a nice touch. So that was that, with a long walk back into town, we all went our separate ways, happy out after a good evening on the tear. Two great finds in Slattery’s and Mother Reilly’s, two grand pubs in Graces and Toast, and an alright one in Rody Bolands. It has to be said, great work from JFlood, it’s only a pity he wasn’t able to do the write-up too. Next months pubs are on me, and we’re back into town for this one! 1. Toast, Lower Rathmines Road. 2. MB Slattery’s, Lower Rathmines Road. 4. 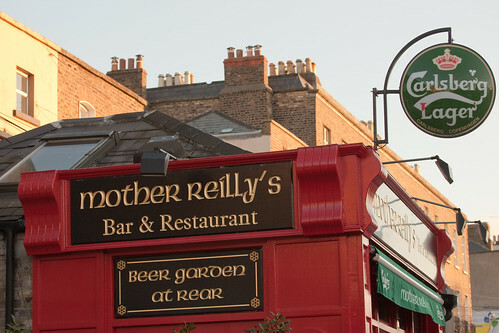 Mother Reillys, Upper Rathmines Road . 5. 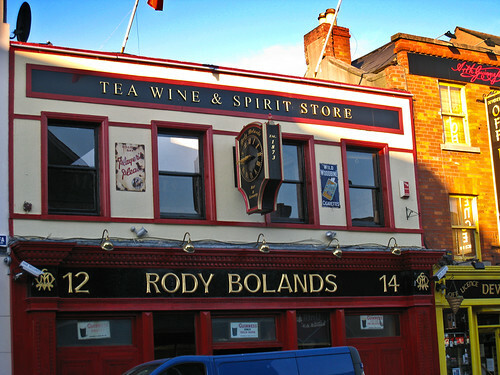 Rody Bolands, Upper Rathmines Road. Bolands should have been dropped and Murphys further up the road from Mother Reilly’s put in instead. The lads in Graces usually take turns from being barred in what used to be 3 pubs, now 2. 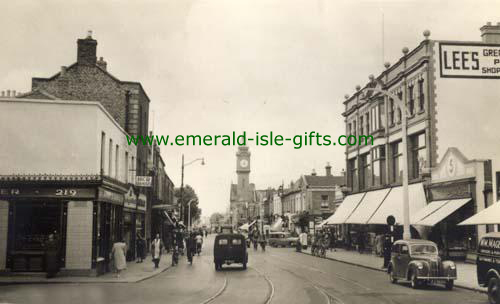 Graces, Madisons (now closed) and Murphys. Eventually apologising to the owner/bar staff of each boozer just after they had been thrown out of one of the others. I should point out the Christy Moore songbook was a present from jaycarax to a younger, folkier Fallon, and that I don’t just carry a Christy Moore songbook around Dublin! A great read, nice one Ci. I should point out that the Christy Moore songbook was going to be thrown out by my Dad so I passed it onto dfallon, I don’t just give away Christy Moore songbook’s every day of the week. Can not believe we’re on 25.
on February 2, 2012 at 1:39 pm | Reply CHTM! Pub Crawl review (Sep 2009 – Present) « Come here to me! Toast used to be Curtains pub when i was in College in Rathmines in 1991/92. Can’t find any pictures of Curtains on the Web anywhere.